Sailing Barge "Reminder"01621 857567work Alternative Accommodation'Reminder' was built in 1929 to carry cargo on the East Coast and has been converted to provide spacious and comfortable accommodation. Moored on Maldon Quay, she is an ideal base for a group of family or friends to enjoy a relaxed break away from the hustle and bustle of modern life. The East Coast provides wonderful bird watching and winter walks - head up river to Beeleigh Falls or down river along the sea wall towards Northea Island. 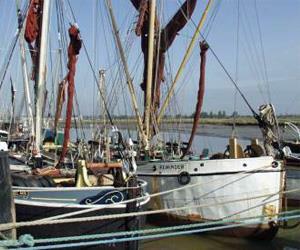 A short drive in the car takes you to other riverside villages such as Mersea and Tollesbury. There isn't a TV, so utilize her spacious open plan galley and saloon for sociable entertaining and cards or board games at her long table. Children will enjoy crabbing from the deck or can let off steam in the promenade park. Two pubs on the Quay and High Street restaurants are within walking distance, as well as two leisure centres. 'Reminder' was built in 1929 to carry cargo on the East Coast and has been converted to provide spacious and comfortable accommodation. Moored on Maldon Quay, she is an ideal base for a group of family or friends to enjoy a relaxed break away from the hustle and bustle of modern life. 'Reminder' has central heating and a cosy solid fuel stove, her 6 cabins provide a mixture of an accommodation to suit most groups. Short breaks mainly catered for although longer stays are certainly available. Close to Promenade Park and high street. Children welcome from any age.